"I have taken this to MANY family and pot luck gatherings and it always is a huge hit. If you have other favorite veggies, you may add, or omit something if your family doesn't like it. Broccoli, cauliflower and mushrooms are just the basics." Blanch broccoli and cauliflower in a large pot of boiling water until just barely tender. Drain and rise with cold water. 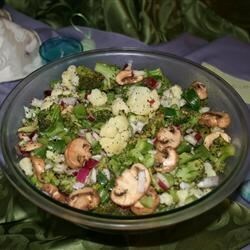 In a large bowl combine broccoli, cauliflower, mushrooms, pepper, celery and onion. In a medium bowl, combine the vinegar, poppy seeds, sugar, mustard, salt and vegetable oil. Mix until well blended. Pour the marinade over the vegetables and mix well. Chill overnight before serving. Keep any extras refrigerated. It was good but I only used half of the marinade-it was so much oil. Next time I will definitely cut down on the oil. This recipe is delicious and quite flexible. I used baby carrots and green, red, and yellow pepper strips and all marinated very nicely. It was very popular with my friends and family. Everybody in my family loved these veggies,especially my son's vegetarian girl friend.Great way to use your garden vegetables! Great recipe - definitely a repeater and oh so easy. A big hit with potluck crowd and hubby. I used a frozen veggie blend and less oil and sugar as suggested in other reviews. Great Marinated Veggies! Hubby ate more than anyone! This was easy to put together and has a nice sort of sweet and sour flavor to it.